Nine monthly patterns and video lessons teach you how to use your Leaves Galore and Hearts & More templates for the most efficient way to cut out, fuse, and stitch this pretty quilt. Now is the time to get those tools out and learn to use them to their fullest advantage. Let me show you how to cut your appliqué shapes with very little waste. There will be not tracing, no cutting with scissors and no pealing off paper backings from your fused appliqué pieces. I am going to teach you all of my favorite methods and help you get this quilt done in a fraction of the time of hand appliqué. Some quilters have asked me if they can make this quilt with hand appliqué. Yes of course! The patterns will feature full size lay out guides with full size appliqué pattern pieces. If you chose to trace and cut, or even hand appliqué your shapes you are more than welcome to join us! So print out your color chart, pull fabrics from your stash, purchase your templates and get ready for monthly lessons in fusible appliqué. We can be finished before next Christmas! Join the fun today. Cant wait to start. Looking forward to making a great quilt. Is this suitable for appliqué beginners? This pattern is suited for the confident beginner appliquer! This should not be your first quilt. You need to be a confident rotary cutter and a confident sewist, but you do not need any prior applique experience. I would recommend using one background fabric instead of the pieced backgrounds. You can do this!! 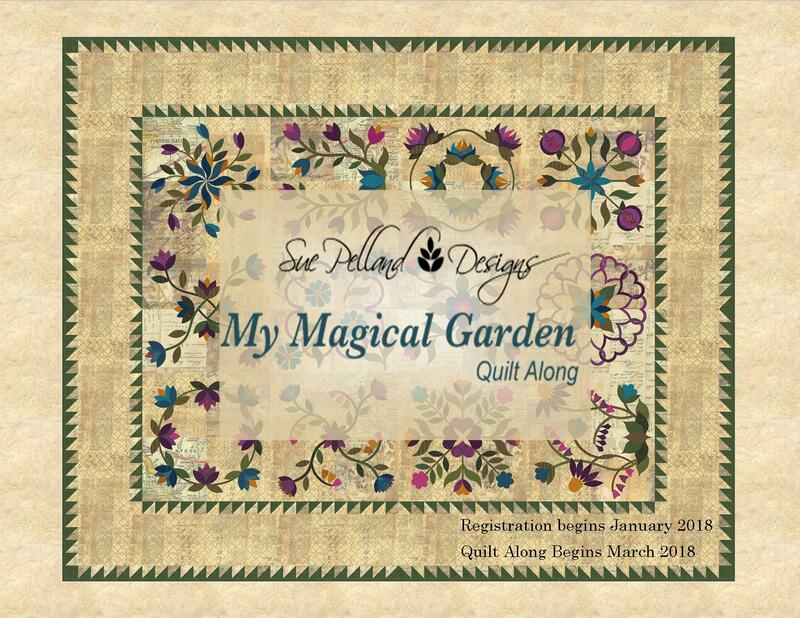 Greetings Sue, Yes, indeed, I am on of your followers that have most of the rulers, used once and that was that...I am SO very excited about this QAL with you...now I will be a doer with your rulers and techniques! I have downloaded the color chart for the batiks as will pull from my stash. What is the fabric requirement for the background if not using Tim H's fabric? I am tempted just to purchase the fabric for it, but I have so much in my stash that would also work. Is this background fabric amount already posted? If so, then I missed it. May I kindly request the location of the info? Happy New Year - it's definitely will be Magical! Hi Sue, Looking forward to this journey and learning more about using your templates. One question about the fabric requirements. If using one fabric for the background does the 8 yds include the borders? Hi Joni, Glad to have you joining us for the Quilt-Along! The 8 yards of one fabric includes the borders and the backgrounds for the 20" finished blocks without pieced backgrounds. The pieced background option requires more fabric, so the total yardage of 10 yards also includes the borders and pieced backgrounds. I just ordered the misty fuse & goddess sheet. Hopefully, they will arrive by the weekend, so I can go to town on my first two blocks when I'm finally off from work for a couple of days. I am really looking forward to doing this project. I've used Steam-to-steam in the past, but really want to see the difference with the Misty fuse. It has been wonderful to see all of your posts so far. Ladies your all doing a fantastic job. Hope mine looks as nice. I am using fabrics from my "stash" so I had to select a wider range of colors that work well together to make the yardages. I will be using a couple of colors as balance throughout the quilt though. I think it will be important to have this balance with all the pieces I am using. I'm excited to use these templates and learn something new. My work schedule makes it difficult as I'm in a new position that requires a lot more of my time, but I will catch up and complete this project.